Claude Weinzorn has a passionate relationship to the wines of and the excellent terroirs located on the granite surrounding Niedermorschwihr. His yields is kept low, and the style is classically elegant in a focused and restrained style. ALL wines are delightful in their purity, and both grape character and the vineyard characteristics are fully expressed. 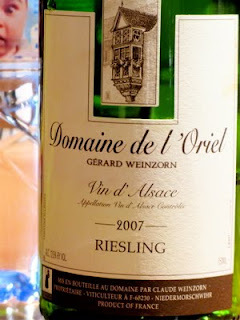 2007 Riesling is based on grapes from young (<30 years [sic!]) vines on the Grand Cru Sommerberg. The aroma is distinctly fruity with yellow apple, melon, clementine and flint. The palate has a fresh attack, it has a slightly less than medium body which is packed with fruit salad, while the finish has intense, almost saline, mineral tones. A terroir wine of high class. Price: € 7.50.